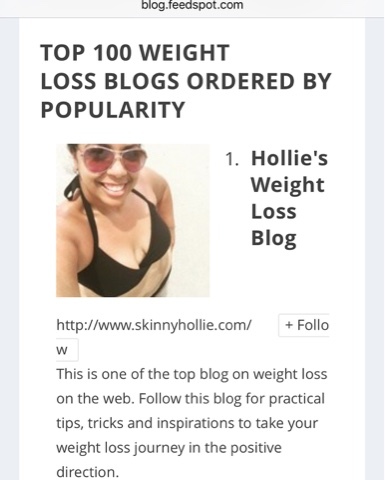 Transforming Hollie: Top 100 Weight Loss Bloggers... Number ONE! Feedspot.com listed my blog as one of the top 100 weight loss blogs! Not only am I in the top 100, I'm listed first! I think this is a huge honor! I'm so thankful to everyone who has stuck with me from day one. Through ups and downs and highs and lows. And thank you to everyone who is following me on my new blog, Transforming Hollie. I appreciate all the support! Congrats!! What a job well done. I have been following you on social media for a couple years now and I am glad to see you overcome obstacles along the way. New to your blog, but love it!!!! I was never successful with losing weight and keeping it off until I accepted that for weight loss to work long term that I must change my day to day eating habits.